The Ultimate List of Content Curation Tools, and accompanying map, is comprised of both business grade tools that can support organizations’ content marketing strategies, as well as personal curation tools that can be used by individuals for hobbyist or organizational purposes. Content curation is when an individual (or team) consistently finds, organizes, annotates and shares the most relevant and highest quality digital content on a specific topic for their target market. Curation is a great way to support your created content strategy, publish content consistently and keep track of your favorite information sources. Enlightened content marketers are using a content mix that is only 65% created, with the remainder being 25% curated and 10% syndicated. 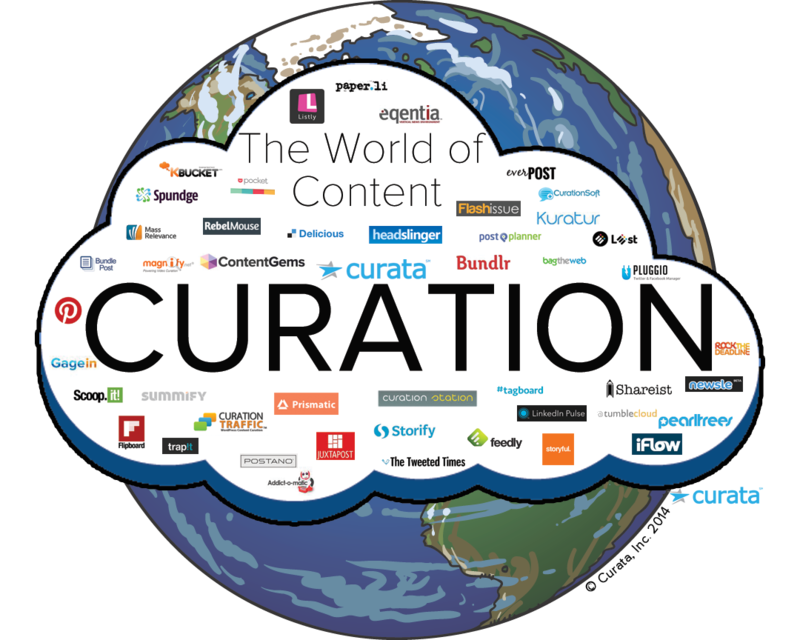 My hope is that this map will help you or your organization navigate the growing world of curation and find a tool that best fits your content needs. If you’re all caught up on The Ultimate Content Marketing Tools List, then you already know that the content marketing tools universe is vast – and still expanding. Marketing and technology are constantly joining forces to provide marketers with simpler solutions to publishing higher quality, relevant content for their audiences. Whether you’re part of the 71% of marketers increasing spend on content this year, or you’re just looking for a tool to help keep track of news and social media, this list of curation tools will help to cut through the curation clutter and make sense of what differentiates each application, service and platform. It is becoming increasingly difficult to keep up with the rapidly expanding universe of content marketing, as well as each sector that it emcompasses – such as content curation. For this reason, this list is not comprehensive. There is no doubt that there are other tools out there that are as effective as the ones listed below, and perhaps serve different functions. In order to help make this list more complete I hope you will suggest additions in the comments section below. Spundge – Spundge is a powerful and easy-to-use content creation platform for professionals and organizations that helps align content with business objectives. The Tweeted Times – The Tweeted Times aggregates news in your Twitter stream every hour and ranks each piece by popularity among your friends. Addict-o-matic – Addict-o-matic is a tool that searches the best live sites on the web for the latest news, blog posts, videos and images so users can keep up with trending topics. ClipZine – The Clipzine is a content curation platform that is able to create a Reusable Sharable Portable stylish zine page in a beautiful magazine-style. Pinterest – Pinterest is a visual discovery tool that people use to collect ideas for their different projects and interests using interactive boards. Feedly – Feedly is an app that allows users to browse and share content from their favorite news sites, feeds, blogs and YouTube channels by delivering fast mobile-optimized content using RSS feeds. Curata – Curata is the leading provider of business grade, content curation software that enables marketers to create, curate, organize, annotate and share the most relevant and highest quality content as part of a successful content marketing strategy. Storify – This social network service lets users create stories or timelines by collecting and publishing content from social media channels such as Facebook, Twitter and Instagram. RockTheDeadline – Rock the Deadline’s unique curation platform makes it easy for brands, agencies and publishers to create and manage compelling content, curate timely news and promote that content over multiple channels. Paper.li – Paper.li is a content curation service that enables people to publish newspapers comprised of content from anywhere on the web based on topics they like to treat their readers to fresh news, daily. List.ly – This tool helps bloggers & brands curate, crowdsource, and engage readers via live embedded list content inside blog posts. Kuratur – Kuratur’s service enables users to consistently publish fresh content on websites or blogs in minutes a day to keep readers engaged. Bundlr – With Bundlr you can create relevant bundles with any kind of content: articles, images, videos, tweets and links and share that content to multiple channels. TumbleCloud – TumbleCloud is a place for collaborative digital storytelling, where users can easily arrange, display, co-create, share and manipulate multimedia content. Pearltrees – This visual and collaborative curation tools allows users to collect, organize and share any URL they find online, as well as to upload personal images and notes. Juxtapost – Juxtapost is a fast, free and simple way for users to bookmark images while they are on the web so that they can collect and manage categorized post boards. GageIn – GageIn empowers sales to sell more successfully by finding the most timely, relevant and actionable real-time news available on the Internet and delivering it to any device. HeadSlinger – This tool helps users find all their news in half the time, scan their favorite sites’ headlines in a matter of seconds and store their favorite news sources in quick, easy to find folders. Scoop.it – Scoop.it fills the need that a growing number of people and businesses have to publish content in an efficient and impacting way using big data semantic technology that helps them quickly find relevant content. CurationSoft – CurationSoft enables content curation for users and helps establish brands as an authoritative voice, as well as a go-to source of information for customers. Liiist – Liiist is a free web-based bookmarking tool that lets users collect any content on the web and compile information into lists so that content can be found and compared easily. TagBoard – TagBoard is a social media hub for hashtags where users can aggregate, moderate and follow hashtags, as well as create and follow their own hashtag conversations. Curation Traffic – This WordPress plugin allows users to collect posts, articles, infographics, videos – really any type of content, and share it in a way that their market will find helpful and interesting. MassRelevance – Mass Relevance helps brands, media and agencies involve and connect with audiences by integrating social media into their marketing and advertising efforts. BagTheWeb – BagTheWeb is a content and curation networking company where users can find, create, and share ‘bags’ of web content on topics they care about. Pulse – LinkedIn Pulse is an award-winning application that makes it easy to consume news on mobile phones and tablets by providing a curated feed from reputable news sources. iFlow – iFlow is a tool that allows users to discover, create, curate and follow real-time contextual streams on any topic across the web into content “drops” that they can then edit, copy and share. Prismatic – Prismatic is an app that provides a home for all of a user’s interests where they can follow all people and topics of importance to them and create a personalized news feed. Trap!t – Trap!t is a personalized content discovery application that can be used by brands, publishers or individuals to discover, engage, share and publish content. Postano – Postano helps brands and organizations distribute curated social media content to websites, event displays, retail signage, and mobile apps to support their content strategy. Newsle – Newsle is a tool that tracks users’ Facebook friends, LinkedIn connections & email contacts in the news so they never miss an important story about a friend, professional contact, or public figure. Bundlepost – Bundle Post content curation tool aggregates and schedules social media content efficiently by searching, editing and scheduling with a browser plugin or social media dashboard. Postplanner – Post Planner is a tool that makes it easy to post like-worthy content by providing status ideas, delivering content based on users’ keywords and helping users find blogs and experts in their niche. Delicious – Delicious is a free online curation tool that acts as a social bookmarks manager where users can use bookmarklets to make lists and categorize them. Flipboard – Flipboard allows users to create their own personal magazine where they can catch up on news, read stories from around the world and browse articles, videos and photos their friends are sharing on social media. Storyful – Storyful is the first news agency of the social media age that aims to help newsrooms find the most valuable content on the social web using a “human algorithm” to sort through verified curated news of various mediums. RebelMouse – Rebelmouse allows users to create a blog, website or social page in seconds by connecting their social networks such as Twitter, Facebook, Instagram, Google+ and LinkedIn. Magnify – Magnify is a video curation tool that allows users to embed hundreds of top-quality sources from trusted media makers in order to enhance their site with topical, timely and contextually-relevant video. Eqentia – Eqentia is a platform for web content publishing, distribution and engagement featuring advanced curation, real-time aggregation and text-mining where content is discovered to match your existing content. Summify – Summify offers a curation service that provides daily summaries of users’ social news feed via email, web or mobile. They were recently acquired by Twitter. Shareist – Shareist is a home base for users’ content marketing activities where they’re able to capture bookmarks and ideas, share them immediately on social media, and save them for building and publishing pages to blogs. Pluggio – Pluggio is a secure, web-based system to help individuals, businesses, organizations and marketers easily grow and manage their social media profiles. Kbucket – KBucket is a user indexed search site where expert “content curators” organize, comment, tag and publish their research to support their content marketing strategy. Flashissue – Flashissue is a Gmail newsletter creator that helps users find content, create mailing lists and get reports & analytics for emails sent with Gmail. ContentGems – ContentGems helps marketers find, curate, and share engaging content so they can build their company’s thought leadership and increase qualified website traffic. Know of any other great content curation tools? Leave a comment below!